The Spare5 team has worked very hard to make sure our interface provides you with all the tools and functions needed to meet the quality expectations of every project. Here is a brief introduction to some helpful Spare5 tools you may have overlooked. Note: some of these tools may be disabled for certain tasks because they are not useful for that particular task. 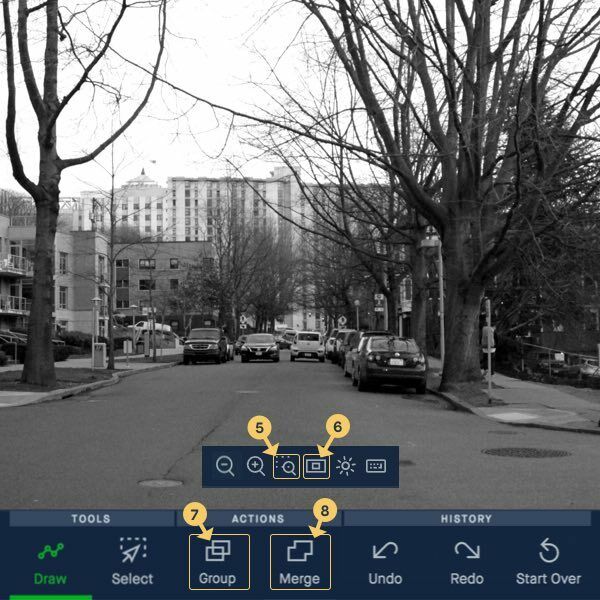 Use this function to look for objects that have already been labeled. For example, if you want to verify that everything has been labeled, you can search for 'Unlabeled' to find those annotations and apply the correct label. In review and refinement images, to which a lot of labels have already been added, you can look for labels that should be applied to verify they are there. The fraction will tell you if there are any pending steps for an existing annotation. For example, if an annotation needs you to check the 'Sign Off' box or if it is missing metadata answers. Click on the Eye Icon to remove and restore a colored label for an object. This can help you find any hidden objects in the image. Click on this icon to magnify the view of a selected annotation. 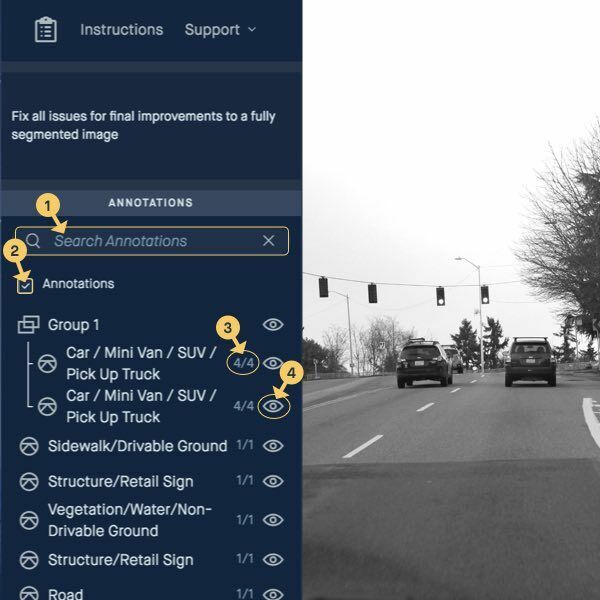 Get close and review existing annotations with ease. Use this tool to zoom out and see the entire image. Use group to associate outlines of segments that belong to the same object but have been divided by other objects or have separate labels for their respective parts. For example: If a motorcycle blocks a portion of the person riding it, you must outline the segments of the person separately and group them together to indicate they are part of the same annotation. Use merge to combine neighboring segments of the same object. You can also merge a bad outline with a bigger outline to “erase” it.